Family Attractions of Valdosta, Georgia has been selected to provide the midway for the 2011 Union County Fair in Union, South Carolina.· The fair dates back tom 1908 and is held in mid-October.· The midway will consist of at least 35 rides. Family Attractions is owned by Dominic Macaroni. Powers Great American Midways (PGAM) has received the contract for the 2011 Danbury City Fair at the Danbury Fair Mall in Connecticut. 2011 marks the 11th year for the Danbury City Fair. The Fair is shifting dates in 2011, from June/July to May 13 through 30. PGAM's Dark Blue Unit will provide the midway. Corky Powers reported to Carnival Magazine that Powers Great American Midways (PGAM) has purchased a Skydiver from Jack Fanelli. The ride has been used less than 40 times. The Skydiver will be fitted with LED lights and completely refurbished during winter quarters. PGAM has also purchased a new ride of Wisdom Manufacturing. The new ride is entitled "Looney Lagoon." It is a spinning coaster and will be on display at the IISF Tradeshow in Gibtown. As reported in January's issue of Carnival Magazine, PGAM has also purchased a new Glass House from Owens Trailers, Inc.
Jeff Blomsness and Danny Huston have become the new owners of North American Midway Entertainment. According to N.A.M.E., "Danny Huston and Jeff Blomsness are very excited to announce that they have collectively sealed the deal to purchase North American Midway Entertainment from the Cypress Group. The Cypress Group, a New York based private equity firm, has owned North American Midway Entertainment since its inception in 2004. The sale of N.A.M.E. to Huston/ Blomsness became effective as of December 20, 2010." North American Midway Entertainment was founded prior to the 2005 season. N.A.M.E. was originally comprised of former Conklin Shows, Farrow Shows, Astro Amusements, and All Star Amusements. The company’s first event was the South Florida Fair in West Palm Beach, January 14 – 30, 2005. N.A.M.E. soon expanded with the addition of Mid America Shows and substantial ride and contract acquisitions from Cumberland Valley Shows. Today, N.A.M.E. is known as the #1 World’s Largest Traveling Amusement Park. The company provides midways for 145 fairs and festivals throughout the United States and Canada on an annual basis. All combined, N.A.M.E. owns 250 rides and travels a combined mileage of 2 million miles per year. Also a Principal of the N.A.M.E. executive staff, Danny Huston has been in the industry for over 30 years. Before N.A.M.E., Danny Huston was co-owner of Mid America Shows. Danny served as Chairman of the OABA. In Indiana, Danny was appointed by Governor Frank O’Bannon to serve on an amusement ride safety board for a four-year term beginning in 1997 and was appointed by the State Speaker of the House for an additional four years in 2002. Danny’s son, Blake Huston is a Unit Manager for N.A.M.E. on the show’s Mid-American Stars Unit. A complete article on this news will appear in next month's issue of Carnival Magazine. 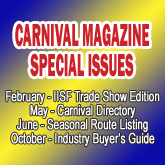 Also check back at www.carnivalmag.com for more updates. Michael Wood with his new ride, the Fabbri Daytona 500 at the IAAPA Expo. SEE JANUARY 2011 CARNIVAL MAGAZINE FOR ARTICLE ON THE IAAPA EXPO!